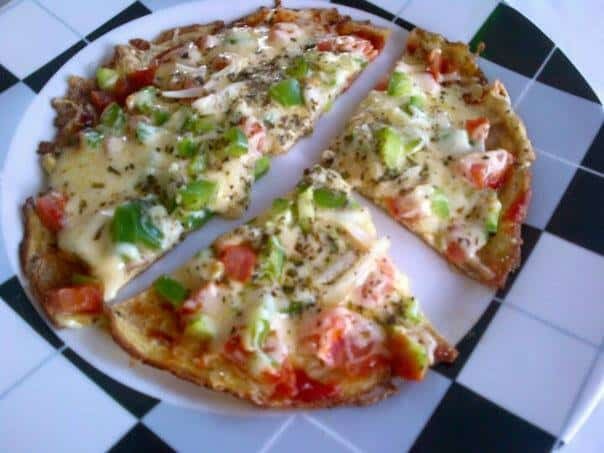 Gluten free pizza. Base made with 1 egg only. Topped with homemade italian tomato chutney, cheese, green pepper and onion. Braise onion in coconut oil/olive oil. Until soft. Add tomato, garlic, tomato paste, salt, pepper and italian herbs. Cook till thick and soft. You can add 1/4 cup water to allow to cook through. Allow to cool. Heat a pan with 1 tspn olive oil or coconut oil. Low heat. Beat 1 egg and throw in pan, it must be round, like making a omlete. While cooking on low heat add toppings. Starting with the thick italian tomato chutney, cheese then other toppings. Lastly end off with cheese and italian herbs. Put the heat off. And close the pan until done. The bottom will be brown.